GEORGETOWN, KY – On Sunday, April 7, 2019, Marilyn Ford, loving mother of three children, passed away at the age of 97 at her home at Windsor Gardens, Georgetown, KY.
Marilyn was born April 2, 1922 in Marquette, Michigan to Charles B. Alvord and Daisy (Bengry) Alvord. She received her Bachelor of Science degree from Michigan State University in 1944 and married Duane F. Ford in December of that year. They raised two sons, Steven and Jeffrey, and one daughter, Sally. After her husband’s death in 2003, Marilyn moved to Georgetown KY.
Marilyn had a passion for golf. She won the ladies club championship and numerous other tournaments, taught her grandson, Kyle, how to play golf, and continued to play the game well into her 80’s. 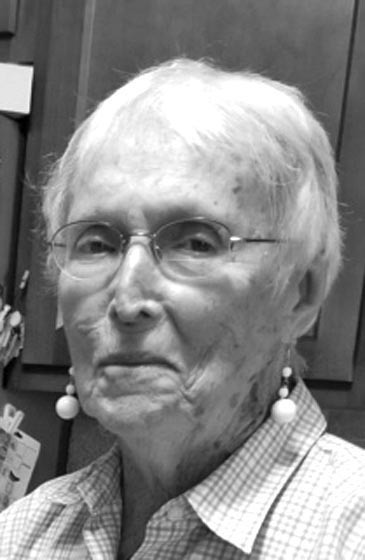 She was an avid walker (up to 6 miles — also well into her late 80’s), gardener, sports enthusiast, and sang in the Georgetown chorus for many years. Marilyn was preceded in death by her son, Steven A. Ford; three brothers Charles, Ernie, and Herbert, and her older sister, Marjorie Sayen. She will be lovingly remembered by her husband Waino Akkala (of Big Bay, MI); her son Jeffrey (Laurie) of Pittsford, NY; her daughter Sally of Georgetown, KY; her four grandchildren: Danielle (Ford) Johnson (Ty) of Plain City, OH; Steven Kreafle of Georgetown, KY; Kyle Ford (Ashley) of Cranberry Township, PA; Amy (Kreafle) Kersey (Bryan) of Lexington, KY; her four great-grandchildren: Madison and Kailey Ford, and Avery and Alyssa Kersey; and her younger sister Harriet Ihlenfeldt of Escanaba, MI. No funeral service will be held. Memorial donations are suggested to Bluegrass Hospice Care, 1317 US Highway 62 East, Cynthiana, Ky 41031. Condolences may be left online at www.blackbur nandward.com.